I really love your knitwear. I've been looking for these for a long time. It's so hard to find really nice classic styles with a great choice of colours. Excellent service. Lovely product. Will be a returning customer. Lovely quality, fit and comfort. This was my first online purchase from Country Collection. My cardigan is a perfect fit and I am already considering what colour to get next time. The online shopping was simple and delivery was quick. Well pleased with this item.Lovely cardigan and lovely colour, this colour and style i have been looking for but could'nt find until now. LOVELY. Lovely cardigan. At last a cardigan that didn't have extra long sleeves in my size. Beautiful shade of claret. Cannot fault it in anyway. Good value. Excellent quality and a lovely colour. Excellent quality and I look forward to wearing it. lovely colour, good fit and excellent delivery. This recent buy was for mothers 92nd Birthday present. she loves these well made, long lasting cardigans. She is now the proud owner of 4 of this product. A good fit. Ironically the weather turned warm so I haven't worn it yet but expect to soon. Delighted with these cardigans! Have purchased before and find they wash and wear so well! It is useful to have so many different colours! I have not worn this cardigan yet but I am sure it will be very useful on chilly summer days. True to size and excellent quality, I can highly recommend. I have not worn this yet but it feels good. So pleased to have discovered these cardigans. Excellent fit and just the right length. Perfect! Very happy with this cardigan. Exactly what is needed - especially as the well known chain from where I used to buy my cardigans has failed dismally over the last few years. As always this is a very good cardigan. I bought it to go with one of your skirts and it brought a lot of nice comments from friends and family. Excellent quality, fair price and I intend to buy further items. Lovely cardigan, excellent value and I look forward to wearing it. Thank you. This merino cardigan suits me well - not too scratchy or heavy. It looks smart and the red spice is a cheery colour. Nice style. Very pleased with this. A lovely colour. Order arrived quickly as usual. These cardigans are really smart and I have several in different colours. They hang beautifully and I don't have to keep tugging the back down like you do with many others that continually ride up. 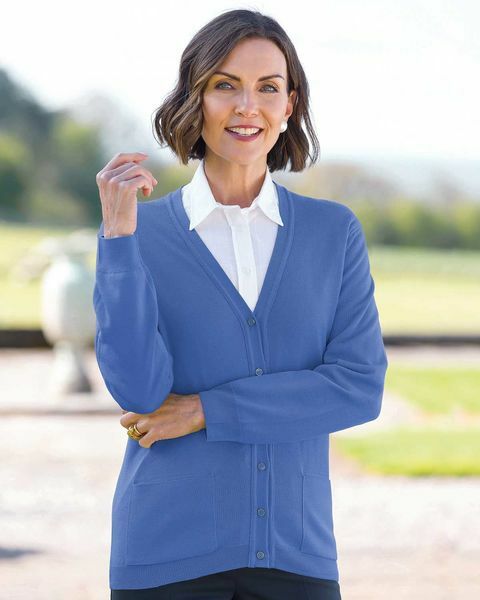 The buttons too match the colour of each cardigan - just a little point to add to the overall smart look. The colours depicted in the catalogue and online are true and overall a very good buy. Ladies Classic Knitted from supersoft, fine gauge merino wool. 'V' neck style with fully fashioned sleeve, front patch pockets and colour co-ordinated buttons. A great way to keep warm in an array of co-ordinating colours. Style with any of our separates for an elegant look. "I really love your knitwear. I've been looking for these for a long t ..."